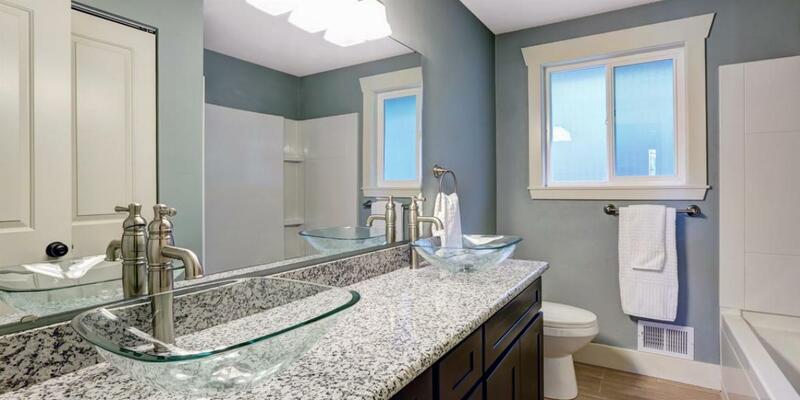 Planning an Inexpensive Bathroom Remodel from Start to Finish? Second to kitchen renovations, remodeling a bathroom can quickly become one of the most expensive home projects. But it doesn’t have to be. With a proper plan and a little creativity, you can makeover your bathroom without breaking your budget. We spoke to Kohler, Signature Hardware, HomeZada and Niagara Conservation for expert tips to help you get started with your low-budget bathroom remodel. The average cost of a bathroom remodel is $9,798, but homeowners can spend up to $14,191 on the high end of the spectrum. 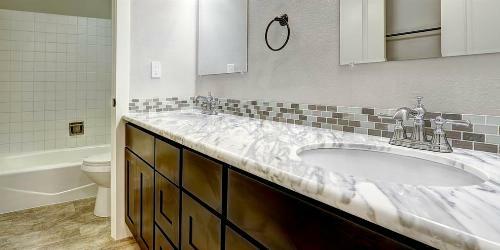 This includes new fixtures like the toilet, sink and bathtub, along with the cost of a new vanity, countertop and tiling. A solid plan is essential. Think about what you want to achieve with your budget bathroom remodel and how much you’re able to spend. Prioritize the projects that will make the biggest impact without draining your budget. Consider working with an interior designer or architect to make sure your timeline, budget and overall design are realistic. Whether you’re retiling your floor yourself or hiring a contractor, it’s important to shop around for the best price. Compare material costs from multiple locations and collect three to four contractor estimates before starting your renovation. Compare department store prices online. Search for deals at bargain stores, thrift shops and outlets. Visit your neighborhood Habitat for Humanity ReStore. Try online resources like Facebook Marketplace or Craigslist. Change your toilet seat and lid instead of replacing it entirely. Retrofit your shower with a new system. Install a pre-fabricated shower instead of a tiled shower. Replace your old shower curtain or install a new glass door. Refinish your tub or shower with a liner. Floor-to-ceiling tile may look beautiful, but the expenses can stack up quick. 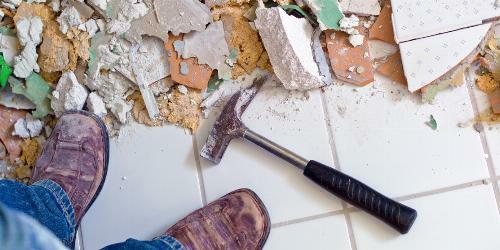 To save money, opt for a durable linoleum or vinyl flooring. You can even skip wall tile in favor of less expensive alternatives like mildew-resistant paint, reclaimed wood panels or wallpaper accent walls. If your heart is set on a natural stone or ceramic tile, reserve it for an accent wall. The smallest details can make the boldest statement. From replacing light fixtures to switching out drawer handles, these inexpensive bathroom renovations completely change the look and feel of your space. Install a new sink faucet, drain and handles. Refresh the hardware on your vanity with brushed nickel, brass or copper versions. Install open shelving to free up counter space on your vanity. Add small items like towel racks, robe hooks and toilet paper holders. Update your floor registers to match your new hardware. Replace outdated track lighting and install energy-efficient bulbs. Switch out electrical plates and plugs. Re-caulk or re-grout the seals around your sink, shower and tiles. Incorporating water conservation into your budget bathroom remodel is a simple way to extend your savings. Installing low-flow toilets, showers and sinks can lower your monthly utility bills and reduce your water footprint—especially important in areas affected by drought. Don’t let the dollar signs stand in the way of creating your Zen retreat. We’re here to help! Read our DIY Bathroom Demo Guide to learn how to save even more by handling the demolition work yourself. Then it’s time to find the right contractor to finish the job.